Yes, the Fit is still as practical as ever with its multi-folding Magic Seats, it still gets decent gas mileage, and still will likely have rock-solid reliability and high build quality. But the Fit Sport I drove recently came equipped with a six-speed manual instead of the CVT. Frankly, that CVT saps the fun out of this little runabout. But with the 6MT, the Fit goes from being a good little subcompact to an entertaining driver's car. Much like nearly every single Honda I've driven with a manual transmission, this shifter is fantastic and completely transforms the car's driving experience. I found myself scouting for fun roads; looking for tight off-ramps. The manual transmission makes this cars orders of magnitude more fun. Paired with the free-revving 130 hp 1.5-liter engine, the Fit Sport with that 6MT is a hoot. Truly, this car made me feel like a 20-something kid again (I'm double that figure nowadays), like when I had a quick-shifting 1998 Honda Civic. 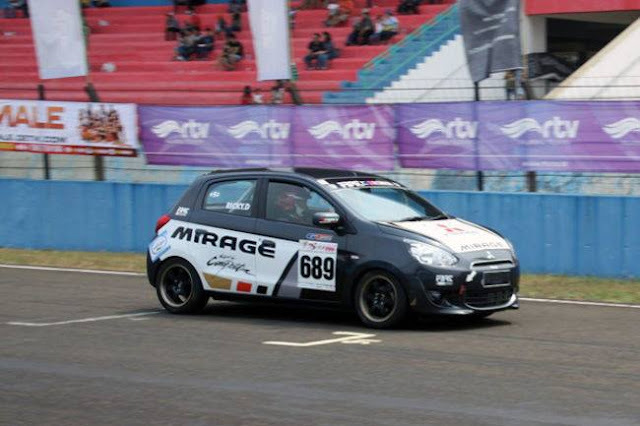 It revs quickly, corners sharply, and has great steering. You know that old adage about how driving a "slow car fast" is lots of fun? That's the Fit Sport. When dressed up in Sport trim, buyers get front, side, and rear underbody spoilers; blacked-out 16" alloy wheels; a seven-inch touchscreen infotainment system; fog lights; and a host of other goodies. I'm still not a fan of the Fit's touchscreen, however. Regardless, this car is a fantastic mix of great driving dynamics, small size, and expertly engineered versatility and practicality. In case you weren't familiar, all Fits come with a 1.5-liter 16-valve DOHC i-VTEC engine with direct injection making 130 hp and 114 lb/ft of torque with the manual transmission, and 128 hp and 113 lb/ft of torque with the CVT. The suspension is composed of MacPhearson strut front suspension and a torsion-beam rear. Side note: I love the rear bumper's diffuser. 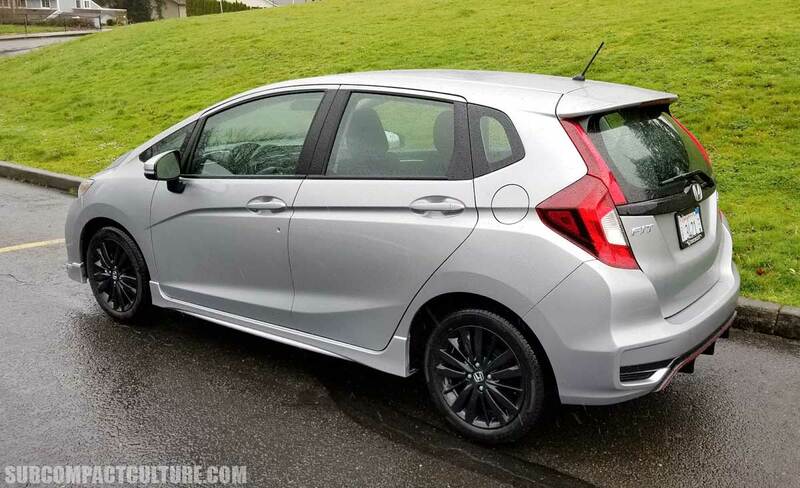 While I'll take the manual transmission option every time its offered in a car, the Fit Sport is one of those instances where the transmission totally changes the driving experience. 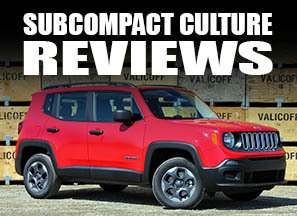 While CVT-equipped Fits are still very good cars, Fits with the manual are very good, very entertaining cars. I would totally rock one of these. Our tester stickered at $18,390, which included the $890 destination/handling charge. FYI, I am a fan of the Toyota Yaris SE, too. However, the Fit has more than 20 more horsepower, it's more practical (thanks to those aforementioned Magic Seats), and I can actually buy one with a manual. (The Yaris SE, at least in the Pacific Northwest cannot be ordered with a manual. Plus, the Yaris' manual is a 5MT.) Did I mention the Fit Sport comes in orange? 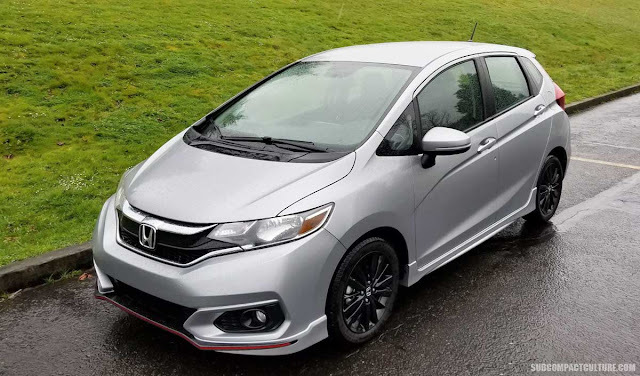 While the subcompact hatchback market has cooled down over the years, Honda's Fit Sport is still a great choice for people who want practicality but aren't willing to sacrifice fun. Really, go drive one. It's great.